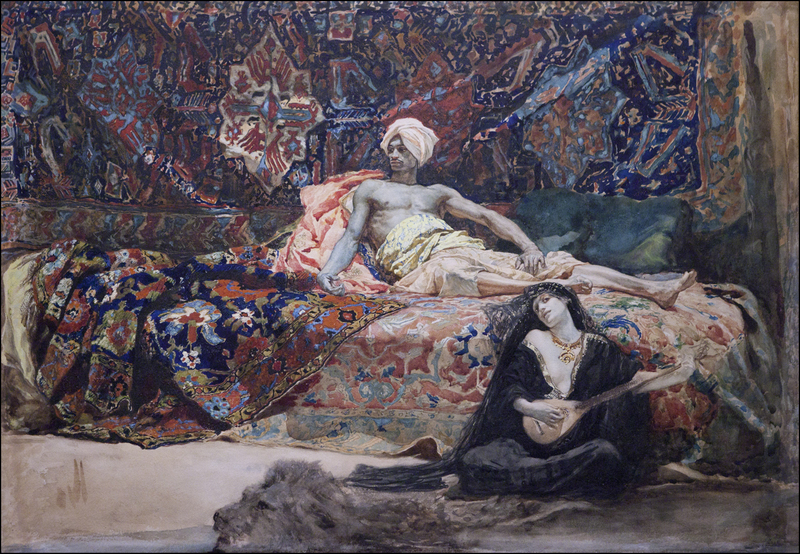 Right now through May 31st, at the Montreal Beaux Arts there is a major show on Orientalist painting (Marvels and Mirages of Orientalism), centered around Jean-Joseph Benjamin-Constant (1845-1902). 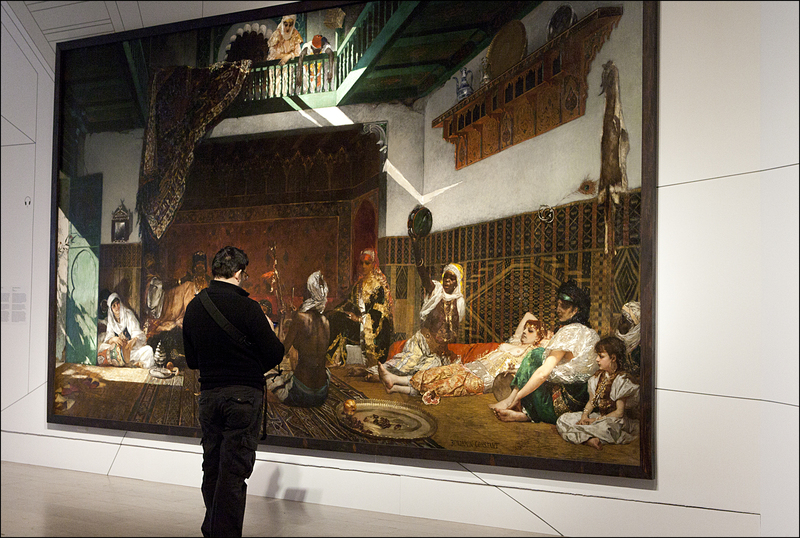 The primary attraction are Benjamin-Constant's massive wall-sized travelogues of an idealized version of Marrakesh based on sketches and experiences from multiple trips to the near East. These are masterpieces of composition and brushwork, full of detail and some very clever texture and finishing effects. 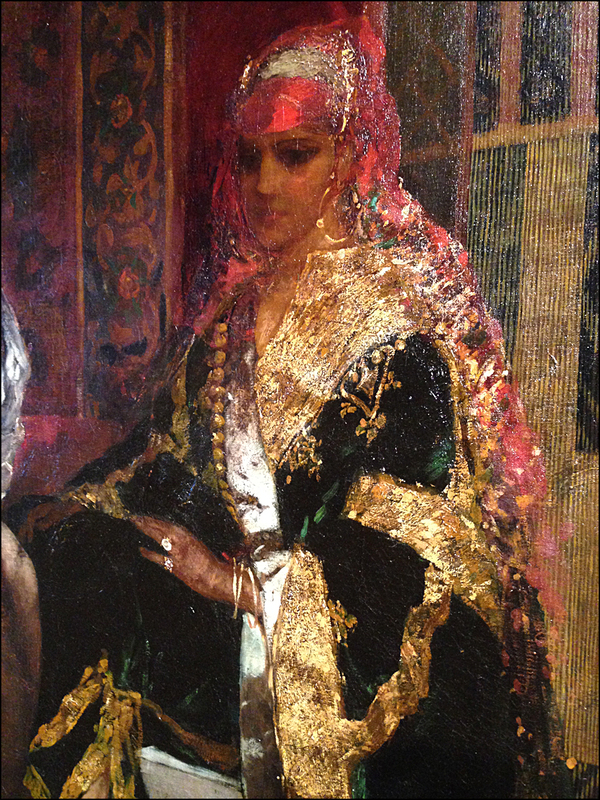 To me, Constant's version of Orientalism is typified by flashy brushwork, almost overly reliant on special effects. But these are effects I love. 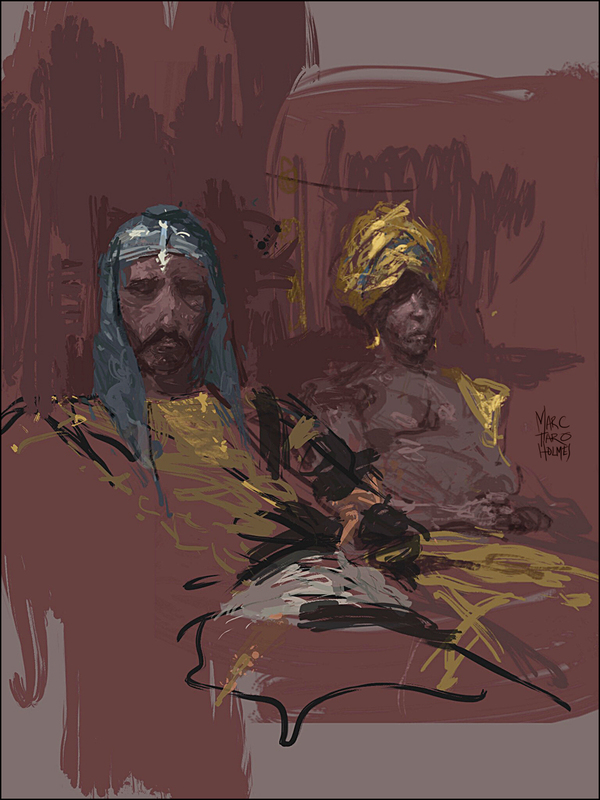 Bright metallic glints floating over dark grounds, hazy implied strokes making transparent gauze veils, ragged impasto textures conveying gold brocade and slashes of raking light. 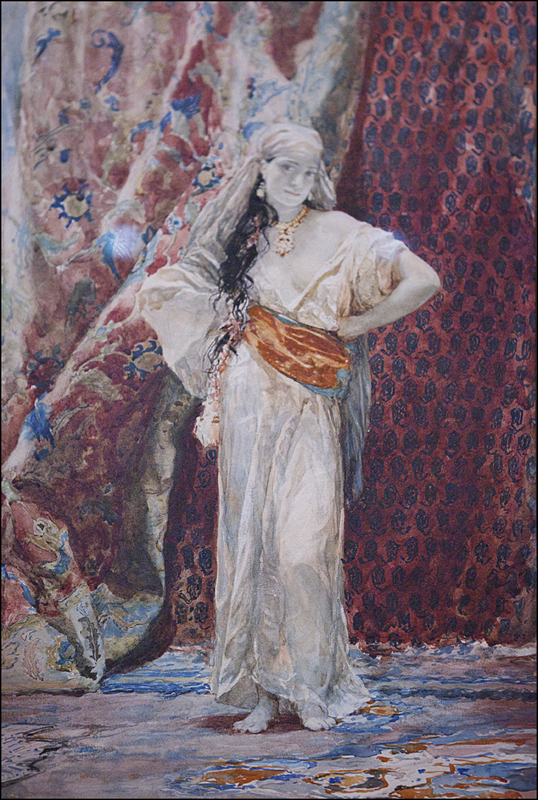 As well, we see some fascinating smaller works, including a pair of mind-bending watercolors by Henri Regnault. These are not the stars of the show, but have special appeal to me. In some passages this is transparent watercolor - but I think they are worked over with a gouache/watercolor mix. It's handled so delicately you can't even detect how it's done. Truly remarkable. At a guess there's about 150 works of art from a dozen artists. You'll also see books and engravings of the period, and some related contemporary work by women artists discussing the cultural fallout from this mileu of languid harem girls and ferocious warriors-eunuchs. So - I know I'll be back for more - but here's my sketches from our first visit. Since these paintings are all about color and richness, I didn't want to simply do line drawings in the museum. I haven't inquired after permission to bring my water media into the gallery, and I know opaque paints are completely out of the question. Somehow I don't see getting much traction there. For now I chose to make sketches on the iPad mini. These allow me to work in light-over-dark color, in a nice clean way that won't get me kicked out of the museum. These are of course, purely studies. 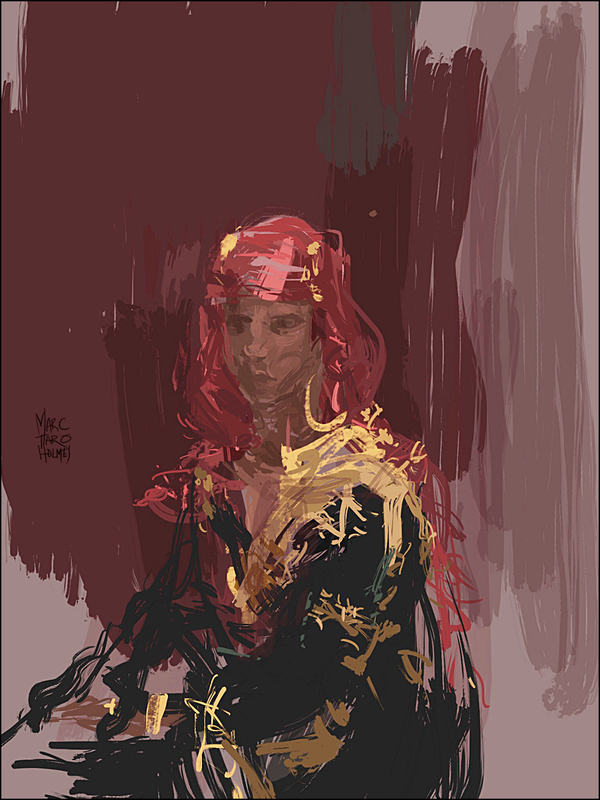 Despite its unlimited potential, I still feel clumsy painting on a digital tablet. But no matter - here I'm just meditating on this (to me) upside-down oil painting light-over-dark thing. So strange for a watercolorist. I've never made gouache work for me in this kind of way. 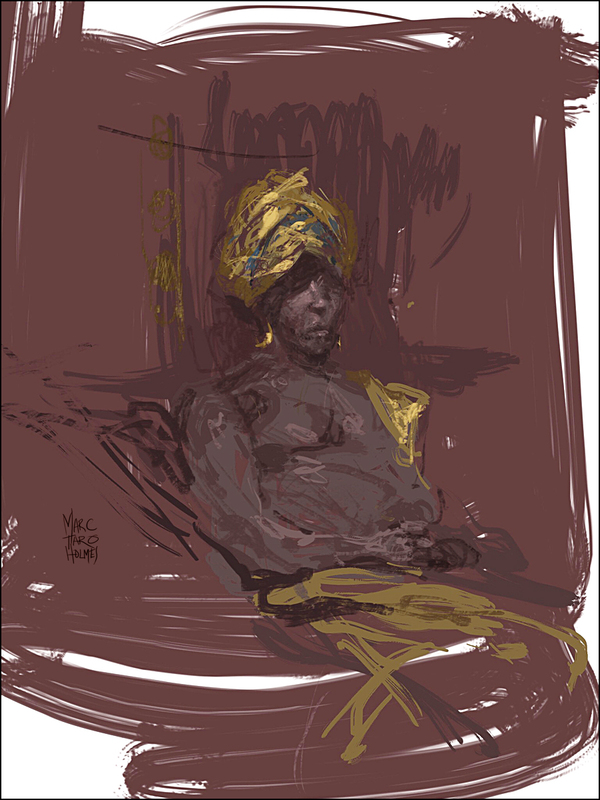 I was inspired to try it after last year's Sargent show - but to be honest, I haven't delved in. These sketches are in the iOS app Procreate, which I prefer over other iPad sketching tools I've tried, for its clever customizable brushes and an approach to layers that is very familiar to Photoshop users.